Is the Charles Camsell Hospital haunted? The Charles Camsell Hospital originally opened in 1946 as a tuberculosis treatment center under the order of Governor General of Canada lord Alexander and was named after Charles Camsell who was a geologist and map maker who uncovered much of Canada's northern areas. A unit was created at the hospital under the direction of Otto Schaefer to study and treat arctic health conditions for the Inuit and Eskimo people were he and his team spent two months a year traveling to the different arctic communities and treating their illness's. The information gathered from these expeditions was later analyzed at the hospital. From his finding Schaefer became and advocate for the return of traditional lifestyles as a means of reducing southern influenced styles of living which seemed to create health problems. 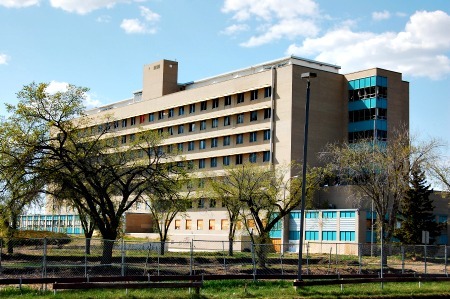 The hospital itself was an experimental hospital run by Canada's Indian affairs program for aboriginal patients and was often known simply as the Indian hospital. This was the hospitals main function from its opening to the year 1967 when it became a more generalized treatment center. During its 22 years as an aboriginal treatment center the patients made over 400 pieces of arts and crafts which were donated fro the hospital to the Royal Alberta museum. The hospital closed down in the year of 1996 due mostly to the levels of asbestos there and has stood abandoned since, with the exception of a few attempts to develop the building but non of these projects were actually finished. In 2006 a fire gutted most of the interior of the building with fire crews being able to do liitle about it due to the large amounts of barbed wire around the entrances which were placed in an attempt to keep out the areas homeless. As of 2009 the building and grounds sit empty and in ruins and a perimeter fence has been installed which is patrolled by private security. Please note that there is absolutely no trespassing in the building or grounds and heavy fines will be dealt out to any trespassers. There are many stories about Charles Camsell hospital and how it treated its aboriginal patients very poorly, including beatings, extreme neglect and even murders. It is also claimed that an area south of the building was used as mass grave for the aboriginal children who were mistreated and killed there, though this is denied by officials who say all those that died at the hospital were buried near a residential school in St. Albert. This is just one example of the stories which are very likely made up about the hospital as all old creepy looking buildings of this nature seem to collect over the years. As for the ghosts at the hospital there are thought to be quite a few, with at least 10 different ghosts thought to linger within its walls. One of these ghosts is thought to be the spirit of a young man who died from falling from the part of the roof he was working on in the year 1982. He is thought to be responsible for the loud thudding noise which can be heard coming from grounds when people approach the area he landed on. Also claims of people seeing ghostly faces staring back from them out of the windows and faint flames such as those from candles lighting up parts of the upper rooms. The fourth floor was used as the psychiatric wing when the hospital was in operation and is thought to be the most haunted area of the building. Tales of patients receiving shock treatment and dying from various cruel forms of rehabilitation are widespread, though again these may just be made up camp fire stories. But whether the treatments were responsible for deaths or not doesn't change the large amount of claims people have made of activity in this area. Screams and whispers from empty areas are among some of the most commonly made claims of hauntings from the fourth floor, as is the unshakable feeling of being followed and watched as you pass through the corridors. Objects placed within the rooms have also been known to have moved on their own accord during the various visits from paranormal investigation teams, and evps have been captured throughout the building. The auditorium is also a hot spot for large brightly colored orbs and the sighting of a mist like figure which has been known to create the pain filled moans which echo throughout the room.